As a Shipwright Apprentice, I have the opportunity to learn a plethora of skills here at CBMM. One of my responsibilities is maintenance of the fleet of vessels here at the museum and one of them is Edna Lockwood. Aside from boatbuilding, a skill I am excited to delve deeper into is the art and craft of rigging. Today I took advantage and tried to glean some useful knowledge as I helped our rigger, Sam Hilgartner as we began the down-rigging of Edna Lockwood. Today was a beautiful day to be working outside. We began by raising the sails, sweating the halyards up to ensure every centimeter of canvas got it’s warm exposure. Giving the sails a chance to soak up the sun and dry completely is key before being stowed away for the winter months. Removing all the lace-lines and freeing the sails, they relaxed and their season of sailing, no matter how short it was this year, was over. Once we had removed the sails, we used the halyards to hoist them from the deck to the dock where we furled them and bound them in preparation for storage. Next we removed both the mizen mast’s boom and the main mast’s boom, starting first with the mizen. Using the halyards again as hoists to gain mechanical advantage, we eased them over onto the dock. 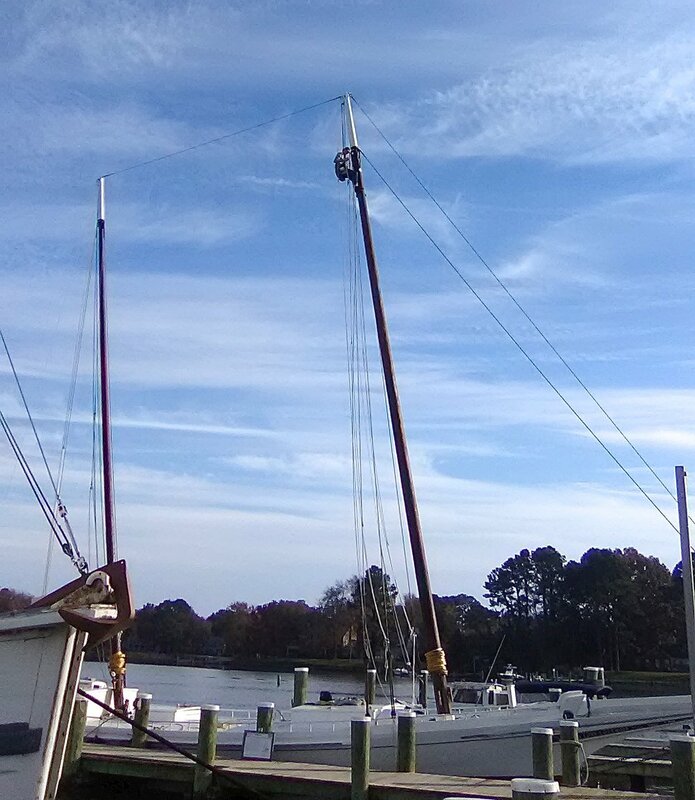 At the end of the day, I went aloft on the main mast in the bosun’s chair and removed the blocks for the jib lazy jacks, jib halyard, and jib sheet. Before removing each part aloft, I secured it to myself with twine so that there is never a time when something is free to be potentially dropped. This ensures the process is done safely.